out how to repair the wires or have the core rewound. Ugh. That’s an expensive proposition. You might want to consider just buying a new motor it might be cheaper in the long run. I opened your picture in a separate window and blew it up. It looks as though the only thing damaged are the connecting wires. 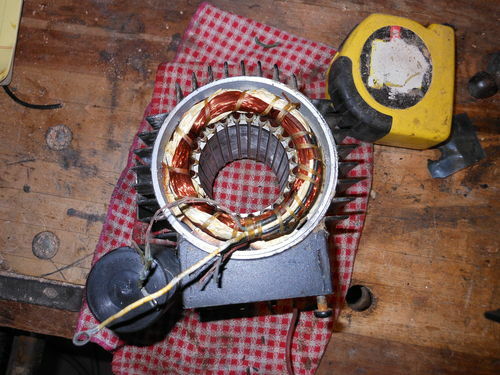 I see no evidence of overheating or degradation of the varnish on the actual motor windings. If (and you really need to check this) that is the case, then the solution might be simple. At a minimum, I would do a quick resistance check from the motor windings to the case of the motor to make sure the varnish insulation hasn’t broken down. I have repaired damage like this to a motor. I walked the connection back to where it connects to varnished wire from the windings and replaced the degraded wire. A good solder joint and some shrink tubing and it was good to go again. I think that one is still running in my shop. I would be concerned about why that wiring failed in the first place. In my case, it was just old age and failure of the insulation on the connecting wires. Is that round black thing to the lower left of your motor a capacitor? If so, then maybe failure of that cap led to overheating and destruction of the wires. Without a circuit diagram or some idea of what the hell they are actually doing with the motor, it is impossible to gauge the success of just replacing the bad wires.